Gothic War (535-554) - After the Iberian War ended with the Sāssānid Empire (see Many Wars below) Justinian was able to focus his attention on his true obsession, conquering the west and resurrecting the old Roman Empire. He started by attacking the Vandals in what would become known as the Vandalic War. But his primary target was Italy, which was controlled by the Ostrogoths. The Vandalic War ended in 534, and by 535, he was already invading Italy. This war would be remembered as the Gothic War. In all, it spanned 19 years and was fought in two phases. The first phase lasted from 535 to 540. Justinian charged his fine general, Belisarius, with the task of conquering Italy. Belisarius attacked from North Africa (where he was stationed as a result of the Vandalic War) through Sicily. The island fell with minimal resistance. In the spring of 536, he crossed into Italy and conquered Rhegium almost immediately. At the same time, Justinian sent a second general, Mundus, to attack on a second front through Dalmatia. Theodahad, king of the Ostrogoths, did not have a large enough army to defend both fronts. So he chose to meet the Byzantines in Dalmatia. As a result, he was able to hold it. But that left Belisarius practically unchecked. By November, he had moved up the coast and captured Naples, albeit with some difficulty. But only a month later, he entered Rome without even a fight. Theodahad had been caught off guard and did not offer any defense for Rome. His people were unhappy with his inaction and deposed him. A man named Vitiges became king and marched an army from Ravenna to Rome. In March 537, he besieged it. Belisarius' forces had been depleted and he had little choice but to fortify himself within the city. The siege lasted a year and was finally broken when Byzantine reinforcements arrived from Constantinople. Vitiges was forced to abandon the city and retreat to Ravenna. The reinvigorated Byzantine army began to march again. Milan, the second largest and wealthiest city in Italy (after Rome), sought liberation from the Goths. Its residents asked Belisarius for aid. He responded by sending a small force. Meanwhile, Vitiges appealed to the Franks and Burgundians for assistance. In 538, 10,000 Burgundians crossed the Alps and joined up with the Ostrogoths. They laid siege to Milan. The arrival of the second army from Constantinople created command confusion among the Byzantines. As a result, relief for the garrison in Milan never arrived and the city began to starve. However, fearing help would soon come, the Goths offered to spare the garrison if its leader, Mundilas, surrendered. Initially he refused because the Goths offered no such guarantee for the civilians. But his soldiers threatened to revolt, so he relented and surrendered in 539. As promised, the soldiers were spared, but as Mundilas feared, the residents were butchered and the city razed. The disaster led Justinian to affirm Belisarius as the supreme commander in Italy. Despite this setback, the Byzantine army was still deep in the Gothic territory and within striking range of the capital, Ravenna. So later that year (539), Vitiges sent envoys to the Sāssānid Empire, seeking an alliance. His argument was simple, Justinian was attempting to reclaim Roman territory which would be bad news for the Sāssānids. Chosroes I did declare war on the Byzantine Empire in 540, but not in time to significantly help the Ostrogoths. Belisarius was making plans to assault Ravenna. The Ostrogoths decided to march out and meet them rather than let them to lay siege to the city. Both armies were camped on opposite sides of the Po River. But then something quite unexpected happened. A large Frankish army, led by King Theudebert I, had crossed the Alps and appeared on the battlefield. The Goths had assumed that the Franks had come to help them. They were wrong. The Franks attacked the Gothic army and annihilated it. The Byzantines may have wanted to thank Theudebert, but before they could, found themselves under attack as well. The Byzantine army was forced to retreat to Tuscany. For the Franks had come to help neither the Goths nor the Byzantines, but to conquer Italy for themselves. They might have succeeded too, but an outbreak of dysentery among their ranks forced them to withdraw as well. When it was said and done, all three sides lost ground. But the Byzantines were still in the best position. Their army regrouped in Tuscany and was replenished by troops from Dalmatia. Once again they marched on Ravenna and this time reached it unopposed. During the siege, Justinian sent envoys to the city and offered to withdraw if the Ostrogoths surrendered and ceded all land south of the Po to the Byzantines. It was 540 and unbeknownst to Vitiges, the Sāssānids had invaded Byzantine territory. Vitiges agreed because his situation was hopeless at this point. However, Belisarius rejected his own emperor's terms and refused to lift the siege. The Goths were now desperate. They offered Belisarius their throne if he would abandon the siege. He agreed publicly, but it was ruse. He had no intention of becoming ruler of Italy. The Goths opened the city's gates and the Byzantine army entered unopposed. But the Belisarius did not attack once inside. Instead he left the city untouched, forced Vitiges into retirement and then returned to Constantinople. It's hard to believe Belisarius was this clever, but what happened after he left may have been what he had in mind all along. The Ostrogoths began to fight amongst themselves and went through four different leaders in the following year, three of them being assassinated. If Belisarius was expecting the Ostrogothic kingdom to descend into civil war, he almost got his wish. However, in the Fall of 541, things stabilized and a new king emerged whom the people rallied behind. His name was Totila (or Baduila) and he had dreams of evicting the Byzantines from Italy and fully restoring the Ostrogothic kingdom. In his favor was the fact that the Byzantine Empire was under attack by the Sāssānid Empire and, at the same time, was being devastated by a horrible plague (see Justinian & Theodora). Thus began the second phase of the Gothic War. Disorganization by the Byzantines and determination by the Ostrogoths led to early successes for Totila. He led an army into Tuscany and besieged Florence. 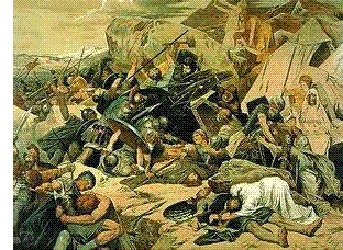 The Byzantine army tried to break the siege but were defeated at the Battle of Mucellium. Being outnumbered, Totila chose to stay on the offensive. He marched south, bypassed heavily defended Rome, and attacked Naples. It was lightly defended and fell without much resistance. Totila's strategy included showing kindness to those he conquered in hopes that they would join him and turn on the Byzantines. And so he left Naples unharmed. But in 544, the Ostrogoths lost a key advantage. The Byzantine Empire made peace with the Sāssānids, and Belisarius who had been fighting on the eastern front, was sent back to Italy. His arrival, though, was unable to prevent Totila from capturing Rome in 546. However, the Gothic army was so small, it was unable to attack and defend simultaneously. And so, Belisarius quickly recaptured Rome in 547. At the same time, Belisarius was having problems of his own. Procopius, our main source for this war, says that disagreements between Justinian and his top general led to a disruption in Belisarius' supply line from Constantinople. As a result, he was powerless to prevent Totila from taking Rome a second time in 549. At this point, he tried to make peace with Justinian, but the offer was rejected. And for good reason. With the Sāssānid war over, Justinian was able to mobilize the remainder of his army in Byzantine territory and open a second front in Italy. He sent in a force in 551 under the command of another able general named Narses. With overwhelming numbers, it was now just a matter of time. 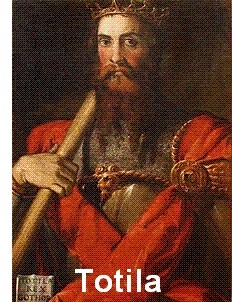 Narses defeated Totila at the Battle of Taginae in 552, and Totila was killed. From there resistance fell apart pretty quickly. The Goths almost immediately abandoned Rome after Taginae, and the newly anointed Ostrogothic king, Teias, was defeated at the Battle of Mons Lactarius in 553. This essentially ended the Gothic War with a Byzantine victory. The Ostrogothic kingdom was ended. However, though it technically won the war, the Byzantine Empire had so depleted its resources and military that it was unable to hold its new territory. The war had created a vacuum in Italy which was quickly filled by the Lombards who migrated into the region and stayed for the next two centuries.